Image of the Universe at 300,000 years old. 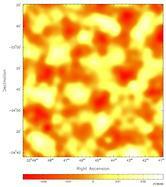 The CBI has imaged the cosmic microwave background radiation from three patches of sky each about 2 degrees square (four times the diameter of the Moon); this shows one patch. The colors represent the intensity of the radiation, with red indicating cool spots and white hot spots. The fluctuations in intensity are only about 100 µK about the average temperature of 2.73 K. This image, with a resolution of 7 minutes of arc, is the sharpest and most sensitive yet made of the surface of last scattering. PDF file / TIFF file. Observing the seeds of galaxy clusters. The CBI detects features with angular sizes between 6 and 15 minutes of arc on the surface of "last scattering," where the cosmic microwave background photons were emitted about 14 billion years ago when the Universe first became transparent. These features correspond to tiny enhancements in the density of the hot primordial plasma. As the Universe expands, the gravity of the dark matter within these clumps will make them collapse into great clusters of galaxies like those we see in the local Universe (Hubble Space Telescope image, right). PDF file / TIFF file. Power spectrum of the primordial radiation. The fluctuations in intensity of the cosmic microwave background are due to sound waves in the early universe created as the hot plasma oscillates under the force of gravity created by the dark matter. The angular spectrum, shown here, indicates the intensity of the oscillations at different wavelengths. 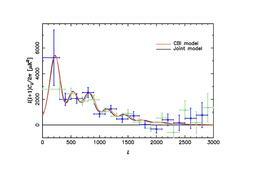 The error bars (blue and green) show the CBI measurements, while the two curves (red and black) show the predictions of two cosmological models with slightly different values of the cosmic parameters (densities of baryons, cold dark matter, and dark energy). Power is plotted versus multipole number l, with higher l corresponding to finer-scale structure in the images. PDF file / TIFF file. The CBI probes short-wavelength oscillations. 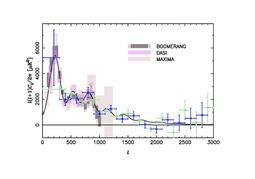 This diagram shows the new CBI measurements of the cosmic microwave background power spectrum compared with the best previous measurements, from the DASI interferometer at the South Pole, and the BOOMERANG and MAXIMA bolometer detectors which were carried above the atmosphere on balloons. The CBI results are in good agreement with the earlier measurements which showed the first 2 or 3 peaks in the spectrum, but for the first time the CBI has detected the higher "overtones" and the drop in the spectrum on small angular scales. PDF file / TIFF file. The Cosmic Background Imager consists of 13 separate radio antennas on a single mount that can be pointed to a particular direction in space. Each antenna is a 90-cm parabolic reflector enclosed in a shield can and protected by a teflon cover that is transparent to radio radiation. 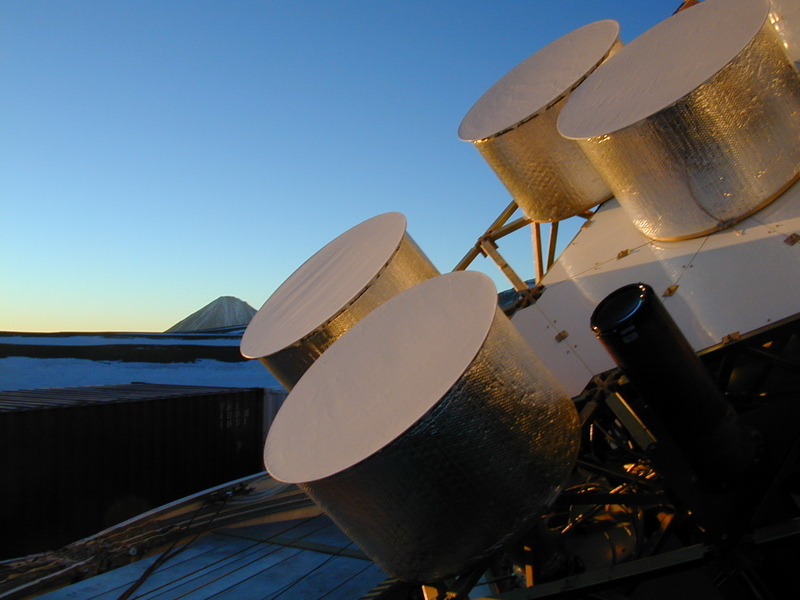 The signals from each pair of antennas are combined in a correlator which rejects the constant part of the microwave background and radiation from the ground and the atmosphere. The resulting numbers are processed to make images and further analyzed in supercomputers to extract the all-important power spectrum. JPEG file (1200×900 pixels) / PDF file. Preparing to observe. Each evening the observers drive up to the high plateau from their headquarters in San Pedro de Atacama, open the retractable dome that protects the CBI, and start recording data as the sun sets. The peak of the volcano Licancabur (5900 m) can be seen in the distance. JPEG file (1600×1200 pixels) / PDF file. 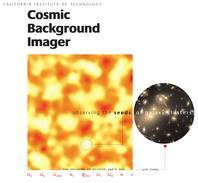 The Cosmic Background Imager. 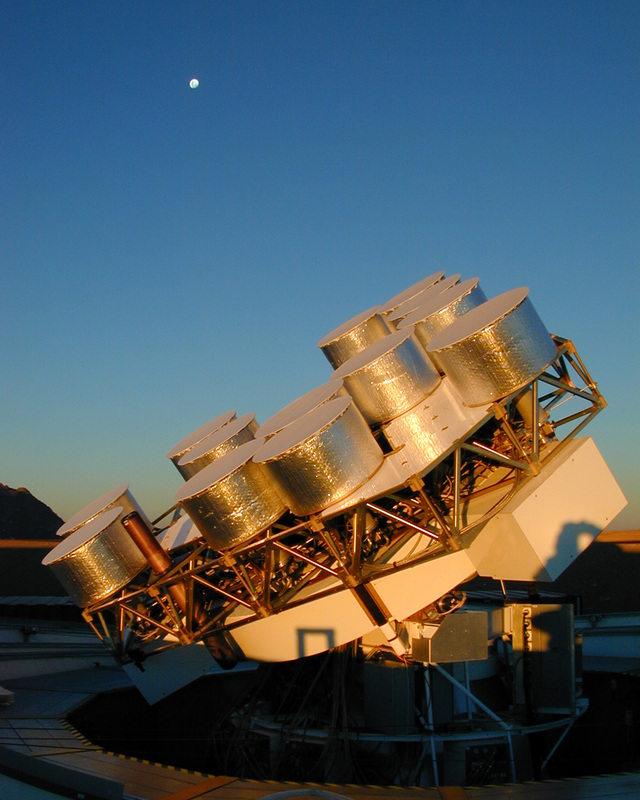 Another view of the telescope at twilight. Each night the telescope maps a patch of sky slightly larger than the Moon. JPEG file (1200×1500 pixels) / PDF file. The CBI dome. 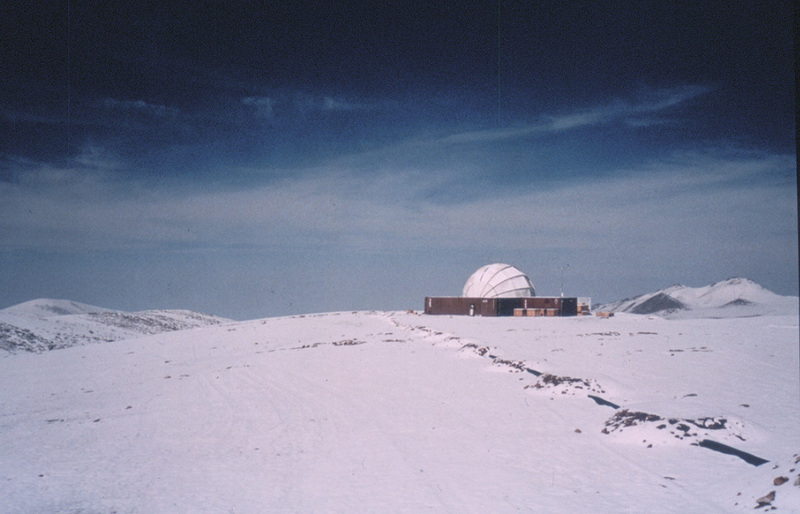 During the day, the CBI is enclosed in a retractable clamshell dome to protect the equipment and the engineers from wind and snow. The control room and laboratory are within shipping containers grouped around the base of the dome. JPEG file (960×617 pixels) / PDF file. 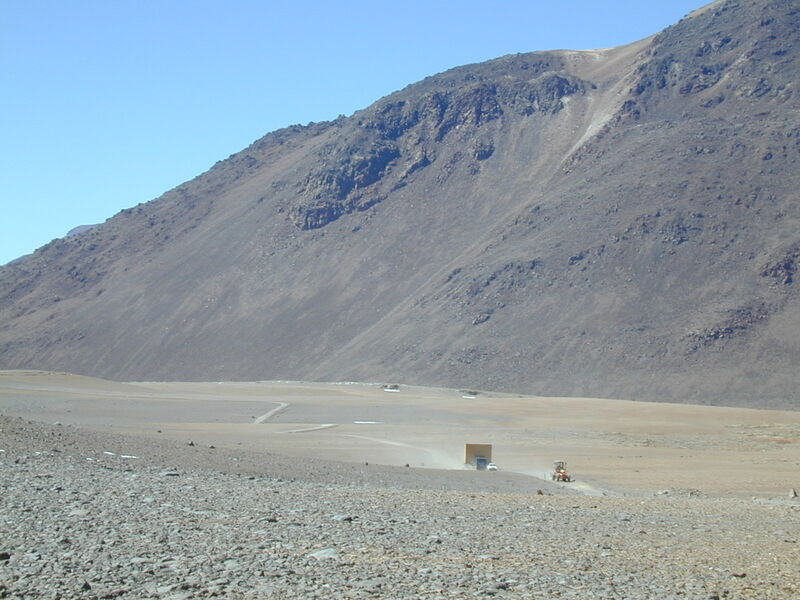 The telescope arrives in the Atacama Desert. The CBI was fully constructed and tested on the Caltech campus in the US. In August 1999, it was packed in a large crate and transported by ship and truck to its observing site at 5080 m (16,700 feet) on the Llano de Chajnantor in the Atacama Desert of northern Chile. JPEG file (1600×1200 pixels) / PDF file. The Llano de Chajnantor. To minimize contamination by the atmosphere, astronomers study the cosmic microwave background from spacecraft, high-altitude balloons, or high, dry sites on the ground. 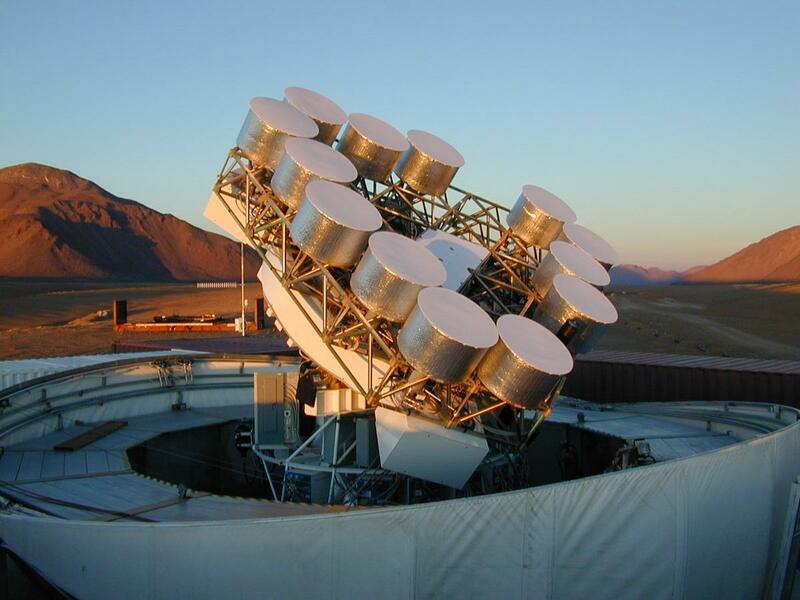 The Llano de Chajnantor in Chile, the location of the CBI, is one of the best sites in the world for sensitive millimeter-wave observations, and it will soon host the Atacama Large Millimeter Array, currently being designed by astronomers from the US and Europe. 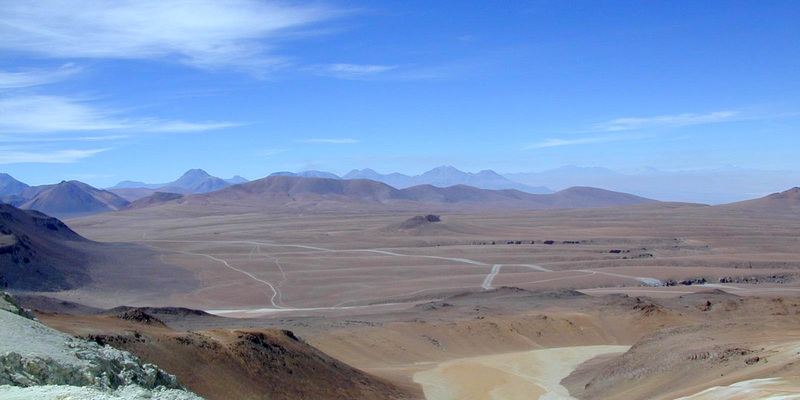 In this view of the plateau from Cerro Toco, the dome that protects the CBI can barely be seen as a white dot in the distance. JPEG file (1600×800 pixels) / PDF file.